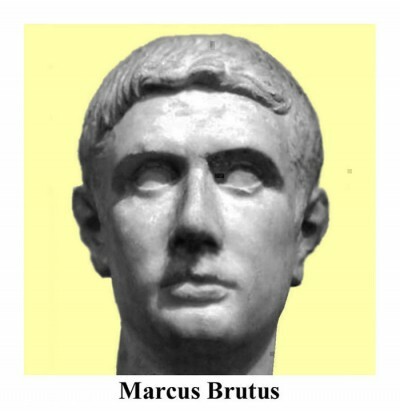 Brutus claimed descendency from Lucius Junius Brutus, also known as the Ancient Brutus, who is said to have founded the Roman Republic in 509 BC after driving the Etruscan king, Tarquin the Proud, from Rome. The Ancient Brutus’ first act was to have the people swear an oath to never again allow another man to be ‘king’ of Rome. Centuries later, Marcus Brutus used this heritage to justify the assassination of Julius Caesar. Servilia Caeponis, Brutus’ mother, was Julius Caesar’s long time mistress. They were ardent lovers before and after the time of Brutus’ birth. Caesar suspected that Brutus might have been his son, and similarly Brutus suspected that Caesar might bave been his father. Cato the Younger was the half-brother of his mother. As did many others, Brutus admired his uncle Cato for his moral integrity, stubborness in standing up for what he thought was right, and his legendary hatred of bribery. This, of course, made him a natural enemy of Julius Caesar. In 58 BC, Cato went to Cyprus to serve as governor. Brutus went with him as an aide. When Cato was detained at Rhodes, he had Brutus manage the treasure of Ptolemy of Egypt who had just committed suicide. Brutus was not only successful in carrying out this assignment, he was also successful for himself, using this treasure ‘to make high interest loans.’ When his term was up, he returned to Rome a very wealthy man. The political situation might have settled down after the assassination with a balance of power being struck between the Caesarians led by Mark Antony and the Optimates in the Senate led by Brutus and Cicero. But the arrival in Rome of Octavian, the vengeful eighteen-year-old great nephew and adopted son of Julius Caesar, upset the two-way political balance and turned it into a three way fight. Brutus and Cassius’ armies were defeated in 42 BC in the Battle of Philippi, Macedonia, by the armies of Mark Antony and Octavian. Cassius commited suicide after the first battle of Philippi. Brutus committed suicide after the second battle of Philippi in October, 42 BC.